Another find from the Bundesarchiv in Berlin. 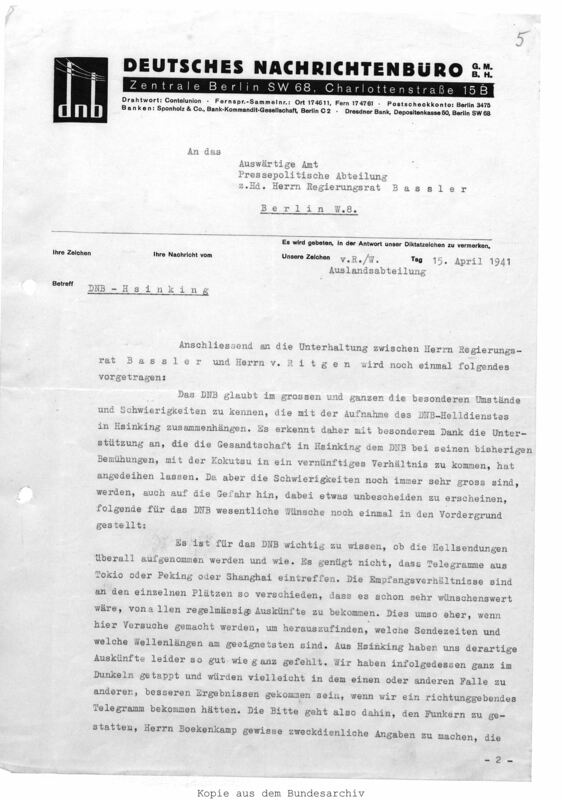 This a document from the German news agency in Berlin, April 15, 1941, to Hsinking (present-day Changchun, in northeast China), capital city of Manchukuo, expressing frustration at a number of conditions present for German propaganda efforts in East Asia. “Tapping around in in the dark,” or “being in the dark,” as it were. Speaking now directly and across the ages to his sponsor: Bassler! I’m on the quest, intermittent and straggling though it may be, to find you and your cronies in Manchukuo! This letter was not sent to Hsinking, but from the head (Wilhelm von Ritgen ?) of the foreign office of the DNB (German press agency) in Berlin to Hilmar Bassler (?) (in charge of NAZI propaganda for East Asia in Ribbentrop’s ministry of foreign affairs) in Berlin. 1. The German diplomatic mission (not an embassy at that time) does never react or respond to informations sent from the DNB to Hsinking. 3. The DNB asks the Bassler to provide a room for the DNB in the German mission in hsinking. Finally, the DNB writes, there is a very good cooperation between the DNB and the German embassy in Tokyo, and hopes to improve the poor situation in Hsinking. 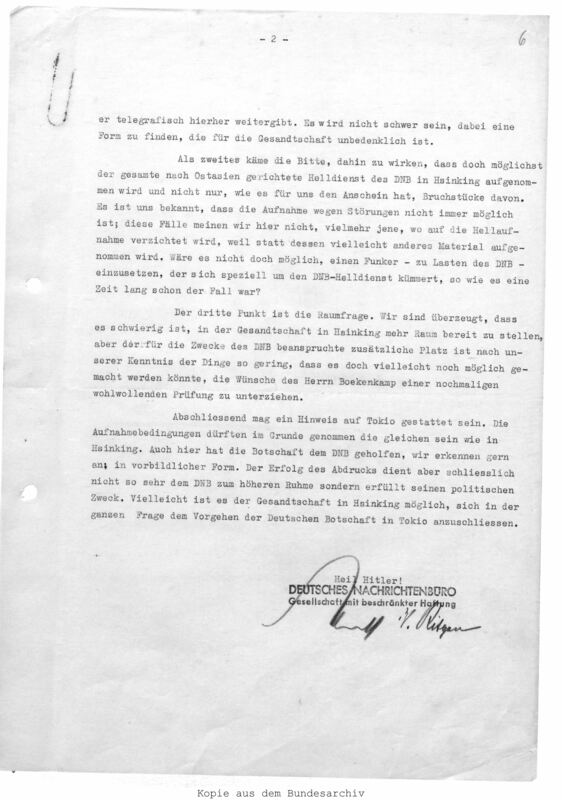 Remarks: This letter contains the technical terms: HELLDIENST, HELLSENDUNG and HELLAUFNAHME. No German can understand these words and that makes it more difficult to understanf the text. By chance checked in google the word HELLSCHREIBER, to find at least some information on that antique method of communication. Werner, Thank you very much for the comment, corrections, and summary! My own grasp of the rather bureaucratic prose construction in the original of this and other documents remains slight, so the assistance is greatly appreciated. And very interesting not on “Helldienst,” etc.